Never mind the fact that while in office Schwarzenegger – an exemplar husband and father – twice vetoed marriage equality (i.e., “gay marriage”) legislation. The 65-year-old Austrian-born former bodybuilder was back on the big screen this year in The Expendables 2, a box office disappointment in North America, but a solid hit internationally. Next in line are the action thriller The Tomb, co-starring The Expendables 2's Sylvester Stallone and The Passion of the Christ's Jim Caviezel, and The Last Stand, in which Schwarzenegger plays a U.S. sheriff out to stop a drug cartel leader from crossing the border into Mexico. Arnold Schwarzenegger gay marriage quote via The Advocate. 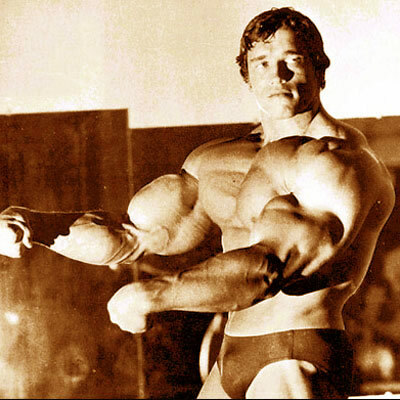 Arnold Schwarzenegger bodybuilding photo from his Pumping Iron days: White Mountain Films / Cinema 5 Distributing.